In honor of the 4th of July, The Frau would like to encourage all expats living in Switzerland to go west. To the Emmental. The Emmental is underrated. Why so, says The Frau? Because no one goes there. Gruyère. Zermatt. St. Moritz. 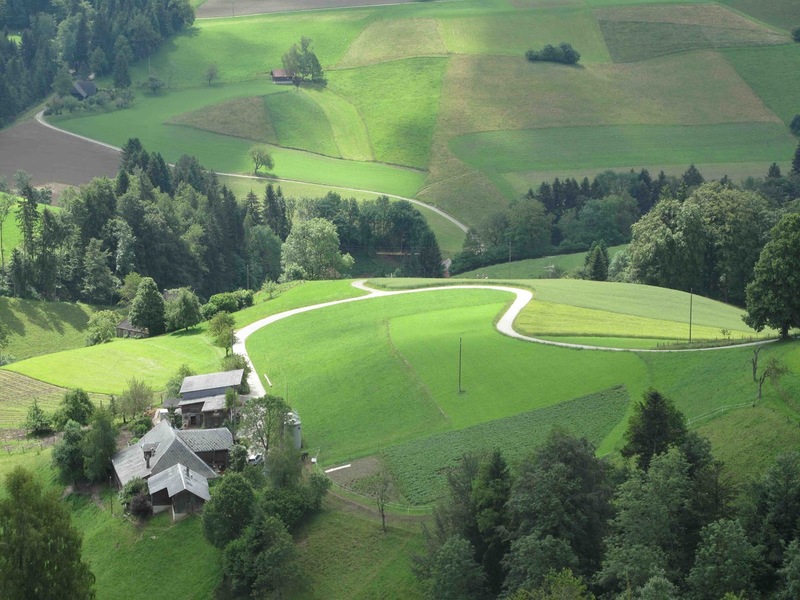 The Emmental might as well be in Canton Aargau for the amount of love it gets from expats. The Frau has a remedy for this. It’s called the photo on the right. This is the Emmental, yodelers. Get out your alphorns and let the message travel for 18 miles. Because the Emmental put the hole in the cheese us Americans call "Swiss." And therefore we should give it a little more credit in this country. 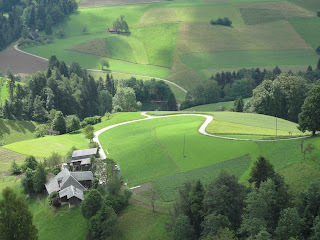 Emmental has rolling landscapes. It has people who say “Grüezi” in possibly the cutest accent in all of CH. And it’s home to a town called Junkholz. What else could you want? Don’t believe The Frau? See for yourself. Do her hike (which is stroller friendly people, so there’s no excuse even if you have a baby for not going to the Emmental). Here’s the 3.5 km hike—which ends at a huge cheese complex. (It's Tipp 7 in the PDF). For those who need a translation, here it is: Take the train to Burgdorf and the bus to Lueg. Start hiking in Lueg towards Junkholz. Pass Schnabel. End at Affoltern i.E. at a cheese (and admittedly somewhat cheesy) factory. It’s not as extensive as the one in Gruyère, but it’s also not as crowded. There’s a wonderful picnic area, a playground to keep kids (or adults acting like kids) busy, a cheese shop, a restaurant serving everything with a side of cheese, and possibly the oldest cheese making house in the world that can still live up to Swiss cleanliness standards. Anyone else like the Emmental? Ja, thank you for teaching me how to spell out Grüessech the proper way for that region. It's exactly what I was referring to! The whole time I lived there, we never went to Emmental, although I have enjoyed the cheese very much. It has a low salt content, did you know, which makes it very healthy to eat. There's a ton of other fantastic places to go "in the west". The whole "Berner Oberland" offers dozens of fantastic landscapes and hiking routes. Also the Lucerne area and its surroundings is very popular among tourists as well as Swiss natives.